Friends and neighbors sharing a picture perfect day at Summer Fest L to R: Angie & Aaron Underwood, Michael Trickey, Jim Uszler, and Diane Trickey. This is going to be a very short blog post because I think the picture above says it all! We love our town, and Long Grove was a great place to be this weekend as we celebrated Summer Fest in the historic downtown with fun, families, food, carnival rides, and great music. It was cheerful to see so many neighbors, residents and merchants enjoying the festivities despite the seasonable heat. Besides, what’s a good summer festival without a little sizzle? Starting at the American flag and moving right: Cindy Brown, Marie Roth, Rachel Perkal, Carolyn Denaro, Angie Underwood. Many residents and merchants are proud of our Village, and have been showing their love for Long Grove by creating decorative mini bridges. In the past month, these little works of art have been slowly appearing in our historic downtown crossroads. I’m impressed by the efforts and artistic talent on display, and for the vibrant designs and rainbow of colors our merchants and residents have used to liven up the community for the summer. One of my favorite bridges is pictured above. I love it for the especially fitting message of peace, hope, and respect. 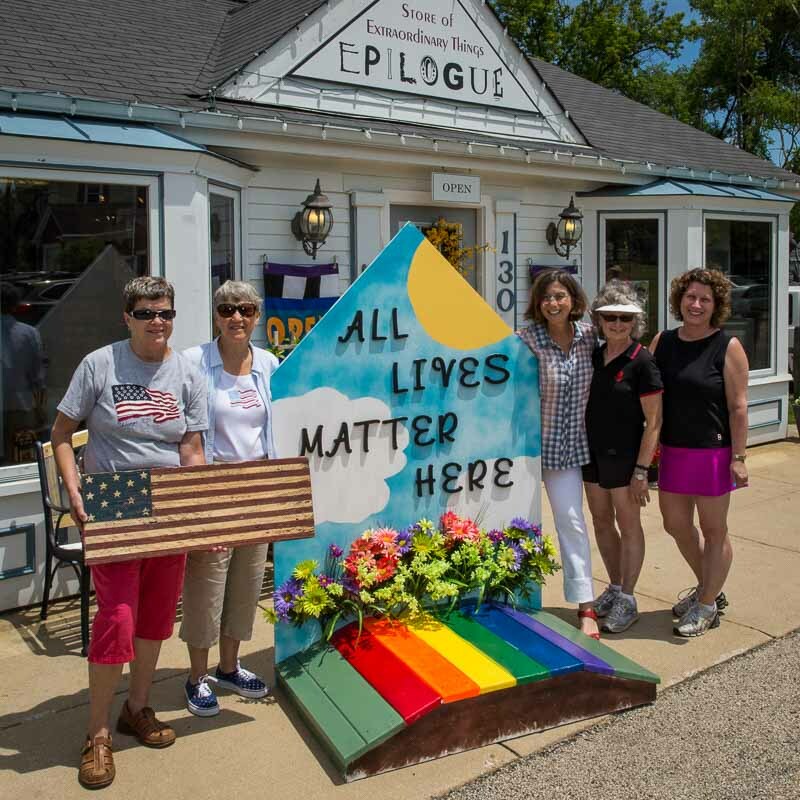 Regardless of ideology, politics, race, religion, creed, color, or whom we choose to love in this world, “All Lives Matter Here.” Bravo to Rachel Perkal and her staff at Epilogue, a lovely store here in Long Grove that features beautiful and unique works of art. 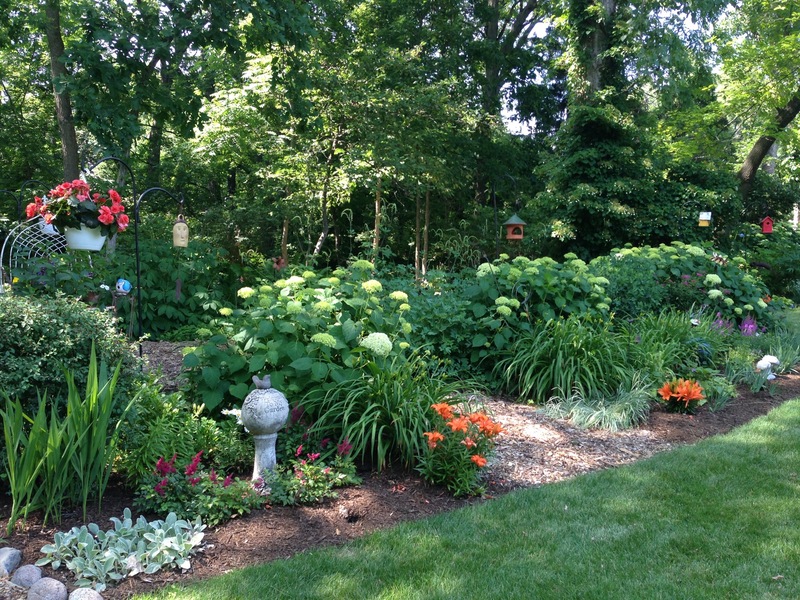 It is one of my go-to spots when needing a special and memorable gift. Resident and artist Marie Roth was featured in a show this weekend of her one-of a kind American flags, created from reclaimed barn wood. Art has a healing power, and love for one another is what truly matters. Some of the women attending the recent WINGS 30th Birthday celebration: (seated L to R) Cheri Neal, Zion Township Supervisor and current WINGS President, and Evelyn Alexander, Founding Member. (Back row L to R) Cynthia Alexander, Mara Grujanac, Village of Lincolnshire Trustee, Nancy Rotering, City of Highland Park Mayor, Alyssa Knobel, Highland Park Trustee, and Angie Underwood, Village of Long Grove Village President. This past week marked a milestone in history as Hillary Clinton became the first woman to secure major party support to be placed on the November ballot for President of the United States. Being raised in nearby Park Ridge, Hillary has her roots in Illinois and we do seem to have a heritage of strong women leaders here in our neck of the woods. Today I want to celebrate the birthdays of just a couple of examples. All of us in Long Grove are delighted to send our best wishes to Barbara Turner today, June 13, 2016, as she celebrates her 97th birthday! Barbara and her family have been instrumental in preserving and sharing some of our high-quality open spaces and natural areas in the Village, as well as advocating for conservation efforts throughout Lake County. 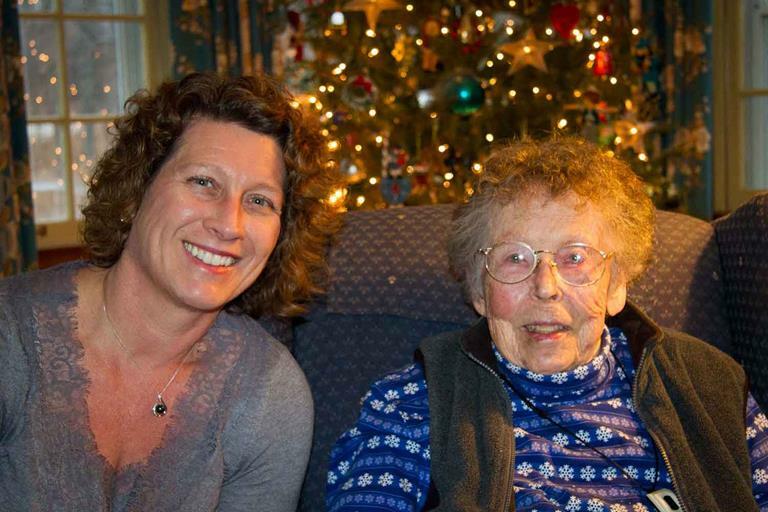 Barbara has been a resident of Long Grove since her youth, and has served the community in many capacities over the years. She is well known to a generation of students as the librarian at Kildeer Countryside School, and was one of the founders of the Long Grove Historical Society, serving as curator and co-authoring a book about our local history. These days Barbara is less able to get out in her beloved nature preserve and battle back the invasive species, but we all know if she could be alongside the interns at Reed-Turner pulling garlic mustard today, she would be! Happy Birthday, Barbara. Another happy milestone was the 30th Birthday Celebration that I recently attended for a group know as WINGS (Women Interested/In Government Service). This Lake County organization was created to encourage women to seek elected office and offer support and education for those women in leadership roles and interested in the political process. This group meets three times a year and offers inspiring speakers and valuable networking, as well as sponsoring an annual college scholarship. The birthday celebration featured a panel discussion with founding members of WINGS discussing their original dream for the organization back in 1986, and their hopes as we move forward. As we saw in the national events of last week, the contributions of women as leaders in America is a story that continues to be told. Our Village Hall was the recent setting for the presentation of over $60,000 in grant funds from United Way of Lake County Women’s Leadership Council. In one of my favorite movies, Beauty and the Beast, Lumiere delightedly sings his famous tune “Be Our Guest“ as he prepares the castle to welcome visitors. Recently, my official duties have included welcoming several groups of guests to our modest but beloved municipal “castle,” Village Hall. This post will highlight two of these spring visits that I’ve had the pleasure of hosting. On May 23rd, 80 third grade students and their teachers from Country Meadows Elementary School in Long Grove made a field trip to Village Hall as a part of a unit they are studying on community and government. The students learned about our own local government, and how we fit into the layers of county, state and federal government. We discussed the types of things our staff and elected officials do for the community, and what my job of Village President entails. For show & tell I passed around my gavel and shiny, official Village President badge, which was a big hit. The kids were also highly engaged when we did some role-playing, with student volunteers sitting at the board table as Trustees to help debate and decide one of the actual issues on the Village Board agenda for the following night: Should we allow the addition of carnival rides to the downtown Long Grove Summer Fest scheduled for June 24-26? Despite some very good discussion on safety concerns, it will probably come as no surprise to learn that all of our young residents voted in favor of this proposal! I promised the students that I would share their input with the Trustees at the meeting the following night, and in fact our actual board members took the future board members’ advice as the agenda item passed. Following their time in Village Hall, the field trip continued with a tour of the Archer one-room Schoolhouse, Outhouse, Pioneer Herb Garden and Ruth Barn, with help from docents Amy Gayton and Aaron Underwood of the Long Grove Historical Society. It was a delight to host our students from Country Meadows and sharing in their enthusiasm and energy was uplifting. Another equally dynamic and energetic group was welcomed to our Village Hall and historic buildings on June 2nd, when I hosted the quarterly meeting of the Women’s Leadership Council of United Way of Lake County. Over $60,000. 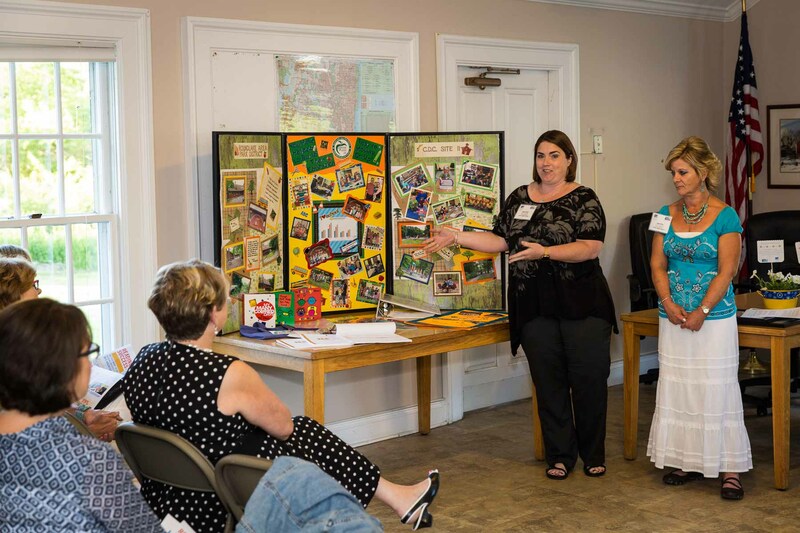 in grant funds was presented to local agencies and programs with the goal of increasing early childhood literacy and kindergarten readiness in the most high risk areas of Lake County. Hearing directly from the educators about the impact these grants make in the lives of the children was meaningful, as was the giant, glittery thank you card the kids created for us! The women of WLC appreciated the charming and relaxed atmosphere of the entire evening in Long Grove, from the start at Village Hall and continuing with tours of the historic buildings until ending at Broken Earth Winery. A nice benefit of my job is being able to share with others some of my favorite places in our Village. Members of the Women’s Leadership Council of United Way of Lake County (L to R) Charlotte Richter, Angie Underwood, and Judy Kotsiopoulos attending the June 2nd meeting in Long Grove.